Anyone who owns a dog is familiar with the "gaze"—that hypnotic, imploring stare that demands reciprocation. It can seem to hold a world of mystery and longing, or just pure bafflement at what makes humans tick. It turns out that the look of mutual recognition between human and dog reflects thousands of years of evolution, a bond programmed into our very body chemistry. Last spring a research team in Japan discovered that both species release a hormone called oxytocin when they look into each other's eyes—the same hormone released when a human mother beholds her baby. What's more, the Japanese study showed that higher levels of oxytocin were released during that gaze than during petting or talking. It seems that for dogs, at least where humans are concerned, eyes really are windows to the soul. "It's a very compelling study, that even on a chemical basis we get this kind of biological impulse to bond, and animals have the same impulse to bond with us," says University of Alberta anthropologist Robert Losey, who studies the historical relationship between dogs and humans. One of Losey's projects involves the excavation of dog remains between 5,000 and 8,000 years old at Lake Baikal, Siberia, the deepest freshwater lake in the world. 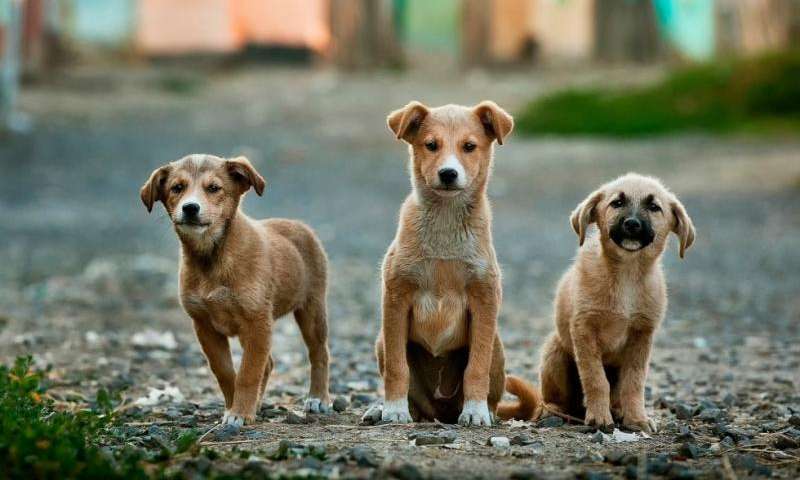 What's striking about the find is it reveals dogs were buried alongside humans in cemeteries, pointing not only to some of the earliest evidence of dog domestication but also suggesting dogs were held in the same high esteem as humans. "The dogs were being treated just like people when they died," says Losey. "They were being carefully placed in a grave, some of them wearing decorative collars, or next to other items like spoons, with the idea being potentially that they had souls and an afterlife." In one instance a man was found buried in the same grave as his two dogs, one on either side. "Globally you can see that there are more dog burials in prehistory than any other animals, including cats or horses. Dogs seem to have a very special place in human communities in the past. As soon as we see skeletal remains that look like the modern dog—say 14,000 years ago—we see dogs being buried." "Early on there's evidence to suggest people loved and cared for their dogs in much the same way we do now, but they were also working companions, involved in all of our daily tasks," he says. "Thousands of years ago there were even lapdogs—the Romans had them. Clearly, people long ago began breeding dogs for specific purposes." All modern dogs are believed to have descended from the Eurasian grey wolf, one subspecies of which branched off and began interacting with humans between 30,000 and 40,000 years ago, "probably of their own accord, without humans intervening in their lives," says Losey. The wolves likely foraged around human campsites, gradually growing less inhibited. Once their potential as companions and workmates became apparent, they were domesticated and selectively bred. Somewhere between 10,000 and 15,000 years ago, the wolf had evolved into an animal genetically indistinguishable from the modern dog. Though today's dog is closer genetically to its ancient ancestor than to the modern wolf, most specific dog breeds have roots that go back only about 200 years. Losey is now investigating a bountiful site of dog burials in the Siberian Arctic. With more than 100 dog specimens, it's the largest archeological collection of dogs in the whole of the Arctic region. Here he's finding early evidence of sled dogs, wearing what appear to be harnesses, along with signs that reindeer were also harnessed. "We see this unique multi-species community emerging." The story of humans and dogs is by no means complete, and sometimes the pieces of the puzzle don't easily fit. But Losey hopes the archeological record will ultimately help us better understand what lies at the heart of perhaps our most enduring interspecies relationship. "The big question in the field now is when and where exactly dogs emerged from wolves, but I don't think that tells us very much," he says. "What can we learn about people's relationship with dogs in the past? The history of our working relationships with animals, and our emotional relationships, is what interests me." I have often thought that "dogs" may have taught us the value of "pack" or how to understand other creatures including each other. They may not be seen to get along yet it is hard to deny hunting as a pack works. "Hey.... ya gonna eat that?" It does seem not entirely coincidental that the time we acquired agricultural skills, which lead to villages, is about the same time modern dogs came onto scene. For an animal with limited brain capacity, they are amazingly good at manipulating humans. It does seem not entirely coincidental that the time we acquired agricultural skills, which lead to villages, is about the same time modern dogs came onto scene. Domestication skills came along with agricultural ones. No big stretch to get that we hit a realization point about the world around us..
For an animal with limited brain capacity, they are amazingly good at manipulating humans. Well, there's a lot of dogs out there with bigger brains than their owners, that's for sure.
" dogs were buried alongside humans" raises a question. Were the dogs killed and buried after the master died, or vice versa?